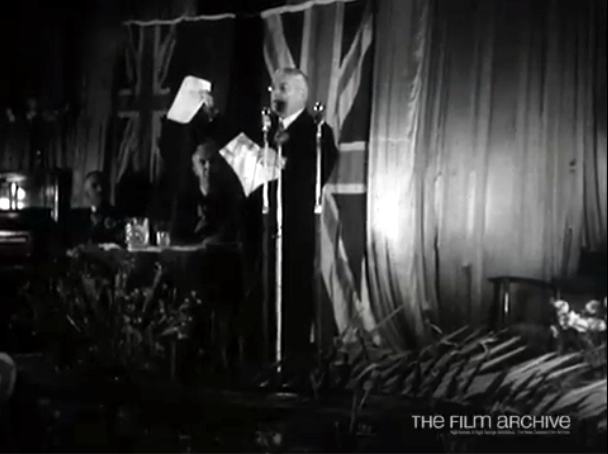 This feature shows politicians on the hustings during the 1954 election campaign. This election was notable for the first appearance of the Social Credit Political League, which challenged the two-party dominance National and Labour had enjoyed since the late 1930s. The clip also shows voters entering polling booths on election day and people listening to the results being broadcast on the radio that night. Political promises, biscuits and beer! Now look at those figures – ten million short! But they managed to win! Reference F11127. Video extract from The elections, Pacific magazine 7, 1954. Courtesy of Pacific Films.